Once upon a time… in Lloydminster, Saskatchewan (now that’s a long return address! ), a student in one of my bra classes asked me if I carried or could get a strap adjuster that she particularly liked, called Slide Lock Adjusters. It was on her ready-to-wear bras but now that she was going to make all of her own bras, she wanted the convenience of these unique adjusters. The thing about them was that the straps would never grow longer during the day under the weight of the breasts. And to shorten or lengthen the strap, it was easy as pie and in the front of the bra, not the back. She even gave me one of these adjusters to take home with me so I could look for it. I am sorry to say that at that time, I could not find those anywhere, try as I might. I hung onto that one adjuster, confident that someday I would find it. The Slide Lock adjuster has two parts – the back and the front which is hinged to it with a pin. The back has a slotted area at the bottom and the front has a decorative bow just for “pretty”. The bra cup should have a strap tab, or something at the strap attachment point to fasten to the Slide Lock. The strap tab goes in the bottom slot, folds over and can be stitched down. In the picture below, I have added a transparent bra cup to show where the bra cup attaches to the slide-lock. Make a one inch finished tube of fabric (or use strap tape) and fasten one end of it to the back of the bra in whatever manner suits you. 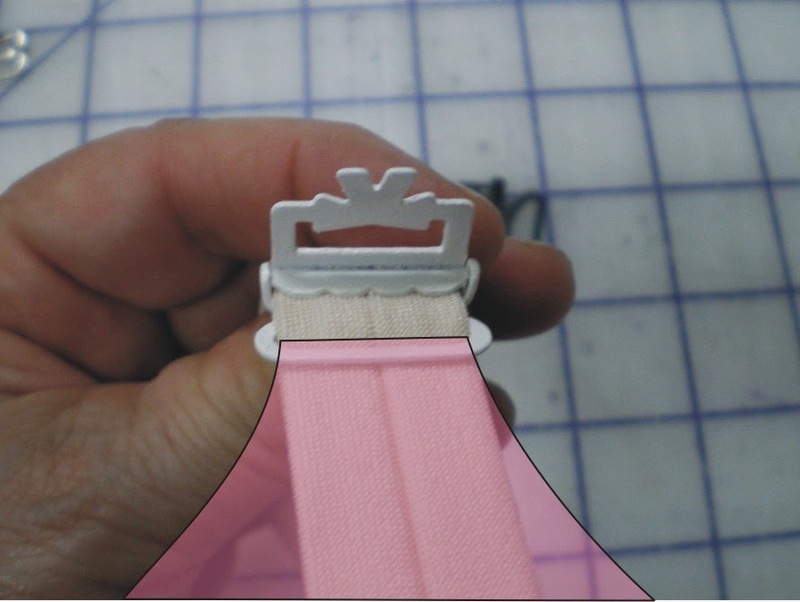 Bring the loose end of the strap to the front of the bra, where it will slide through the open Slide Lock at the place marked A in the picture. If you don’t do the next step, the end of the strap will be sticking out at the front of your bra! Slide the strap through the same slot as the strap tab of the cup. The strap will now be inside the cup, where it belongs. Here’s the fun part. With the Slide Lock open, adjust the length of the strap to where you want it, and close the front part to lock it in place. Try pulling it! It won’t slide back. What an easy way to make straps. No more sliders and rings are necessary. The Slide Lock adjusts the length and holds the strap in place without the tail of the strap being seen (it is tucked inside the bra cup). It also provides a decorative joiner between the strap and the cup (which can sometimes look a little clumsy). Are these only usable with full 1″ items? I am wondering if they could be used with 18mm strapping, aka 3/4 inch strapping. They could and they will hold but the 1″ strap will go completely from side to side of the slot, whereas the 3/4″ will have a bit of space at each end. Hi, I am trying to shorten the straps on a sundress without having to cut and sew the strap, would this slide lock adjuster work ?